How many of us often lose our keys (and in the very same process, gain a few strands of grey hairs as well as lose some sanity), only to call the locksmith and change the entire household’s locks? This could turn out to be a rather costly affair in the end, not to mention time consuming and inconvenient. 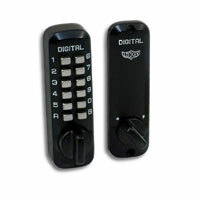 Why not settle for a keypad deadbolt lock that does not run on batteries or electricity? Smart Home is offering the Ultra-Secure Digital Deadbolt for just $99.99, and it is worth the investment since you would not want to risk your little piece of Utopia being broken into without a fight. This security device is completely weatherproof, so you won’t have to worry about the elements doing a number on it and keeping you locked out of your very own house. The mechanical door lock will release the deadbolt upon the correct entry of the programmed code. There is no limit set for the number of times where you can change the code, further enhancing the flexibility of the Ultra-Secure Digital Deadbolt. Even a seasoned Level 20 thief will find the Ultra-Secure Digital Deadbolt more than a match for his lockpicking skills. You need not fret about the longevity of this device as it comes with a lifetime mechanical warranty. Choose from over 10,000 programmable combinations to keep your household safe. As variety is the spice of life, the Ultra-Secure Digital Deadbolt will fit into virtually any home as it is available in chrome, antique brass, brass, and satin nickel. Of course, do bear in mind that there is nothing foolproof in this world, but the Ultra-Secure Digital Deadbolt does play an important role in keeping your house more secure than traditional locks. Coupled with a good CCTV surveillance system and a pair of Rottweilers roaming the grounds, it should not be a problem to deter even the most determined looter. The Ultra-Secure Digital Deadbolt could be the final piece in the jigsaw to complete your home security layout.